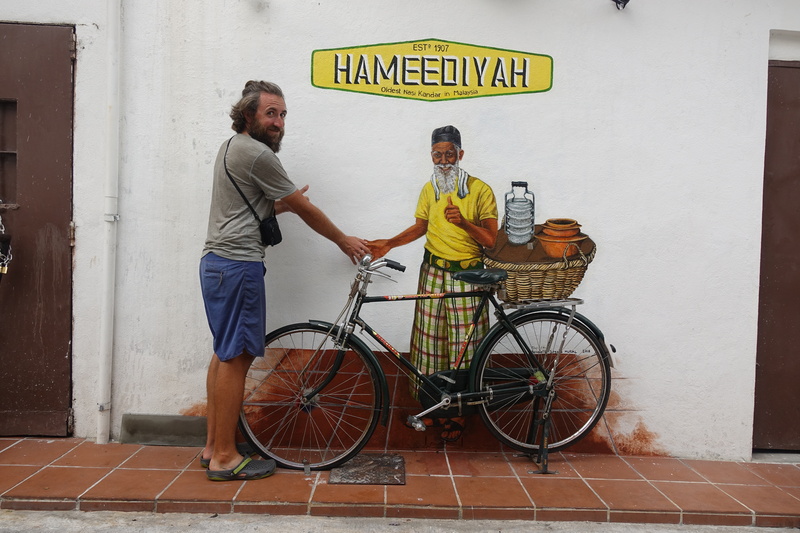 Now to get back to the last update about Malaysia… in addition to Ramadan and the heat, we also want to showcase some of the things we saw in the country. 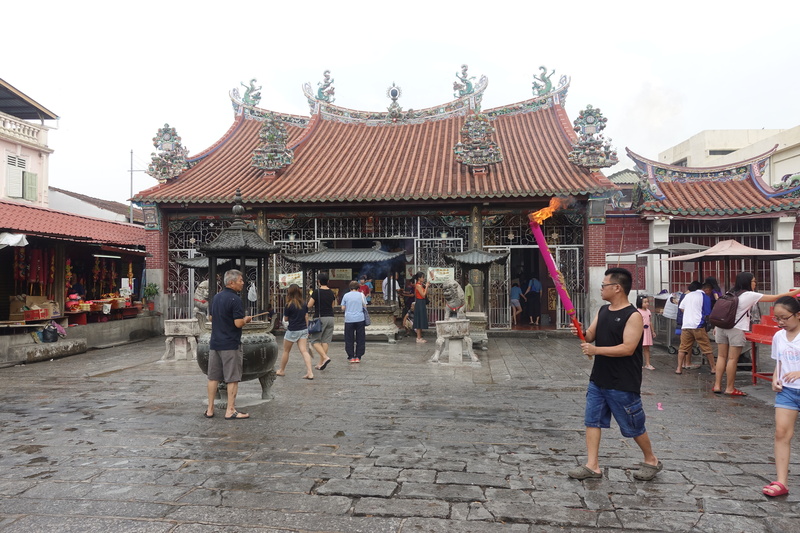 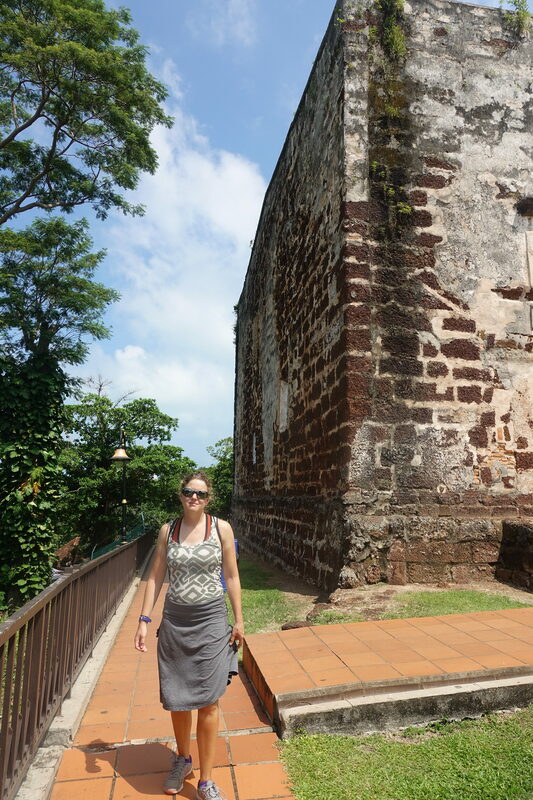 In the two weeks that we were there, we visited two UNESCO world heritage cities: Melaka and George Town. 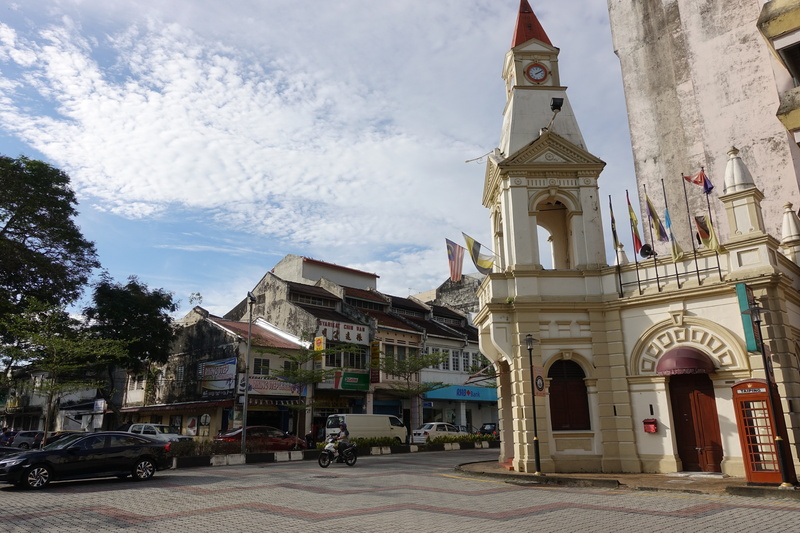 Melaka is an old trading city in Malaysia and has been influenced by hundreds of years of foreign colonization (Portuguese, Dutch, and English) and different cultures coming through its ports. 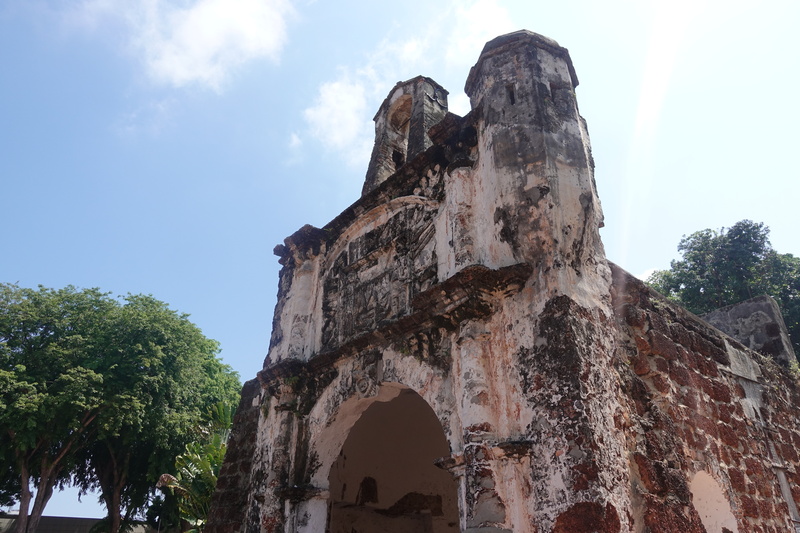 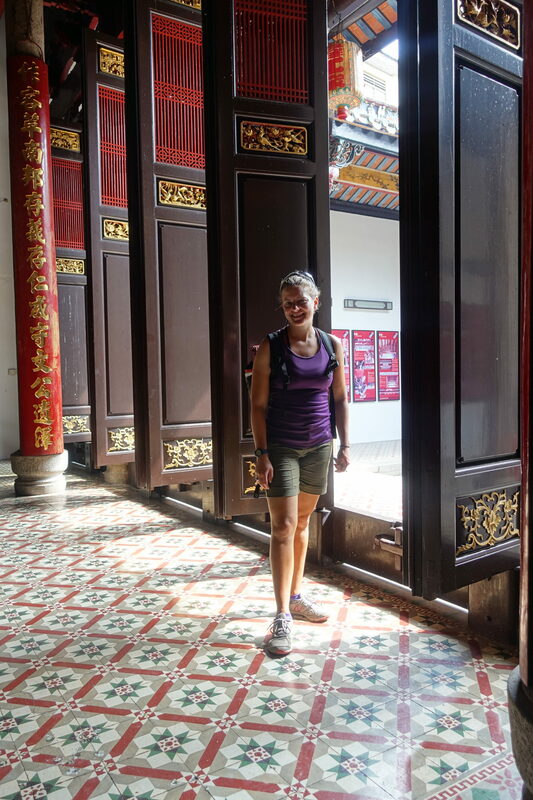 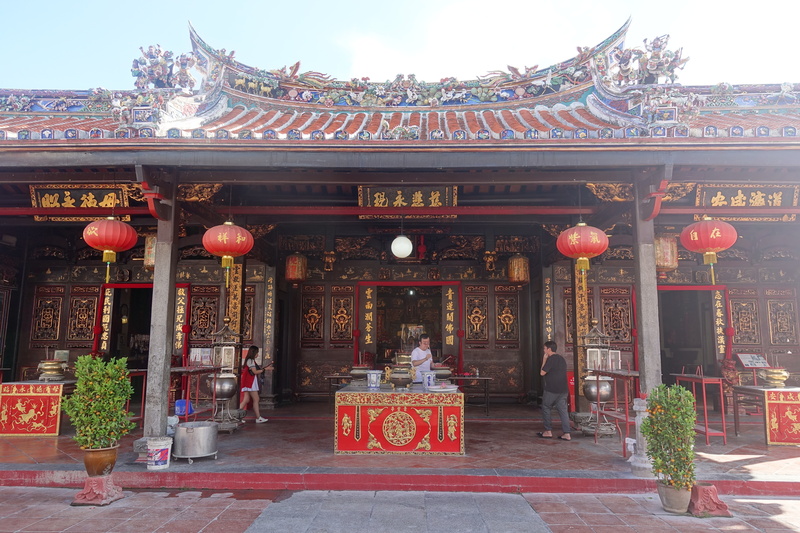 As Cédric and I spent an afternoon wandering the city, we saw the red Dutch Stadthuys, A Famosa – the ruins of a Portuguese fort, the Chinese district, and the traditional houses of Kampung Morten. 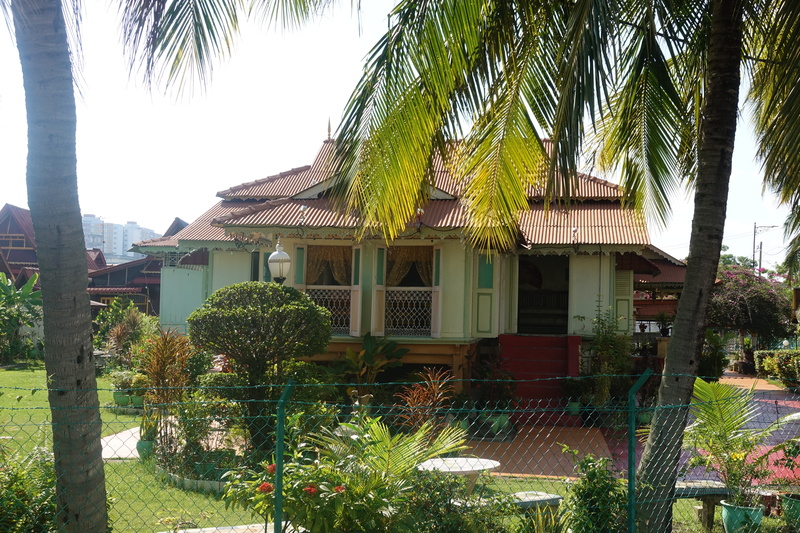 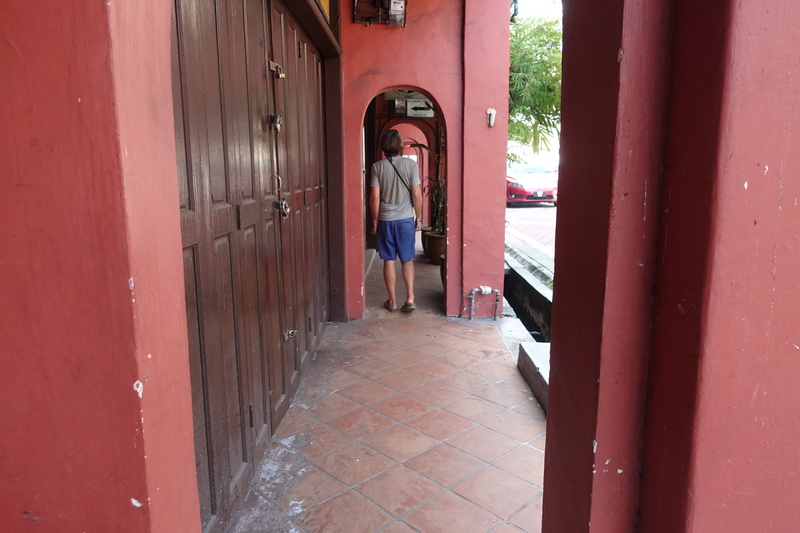 It seems that every time we turned a corner, there was a new district of Melaka to discover. 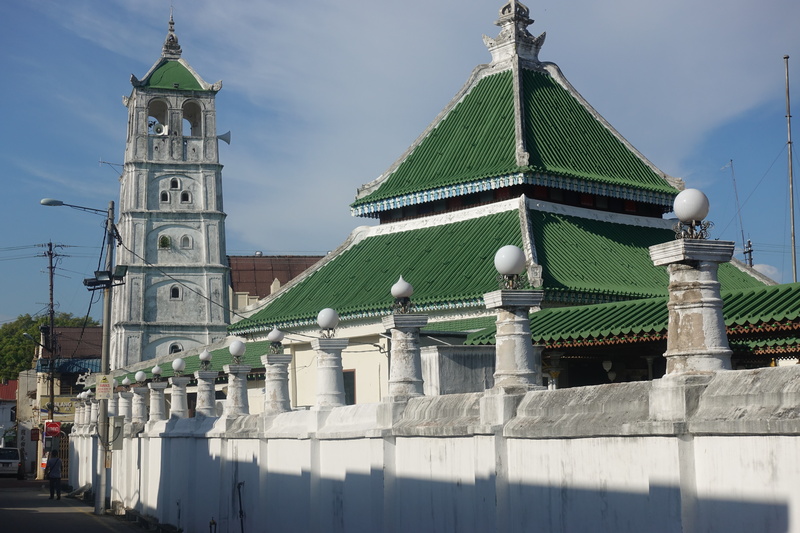 The entire old city is a mixture of centuries and culture, with some improbable combinations of centuries old Portuguese houses between Malay and British architecture with a Chinese Pagoda in front and a mosque behind. 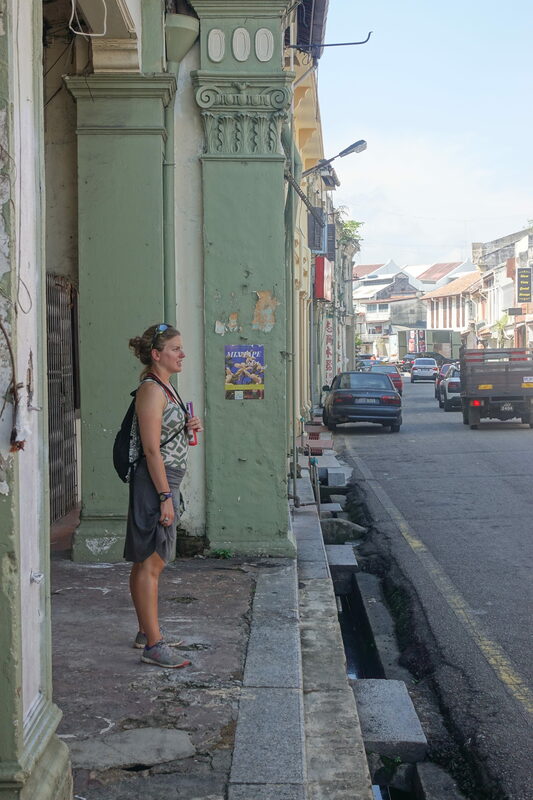 Although we were surprised to see a lot of tourists on the main intersection (we rarely saw any tourists on the back roads of Malaysia), it is easy to walk a bit and enjoy getting lost in smaller streets. 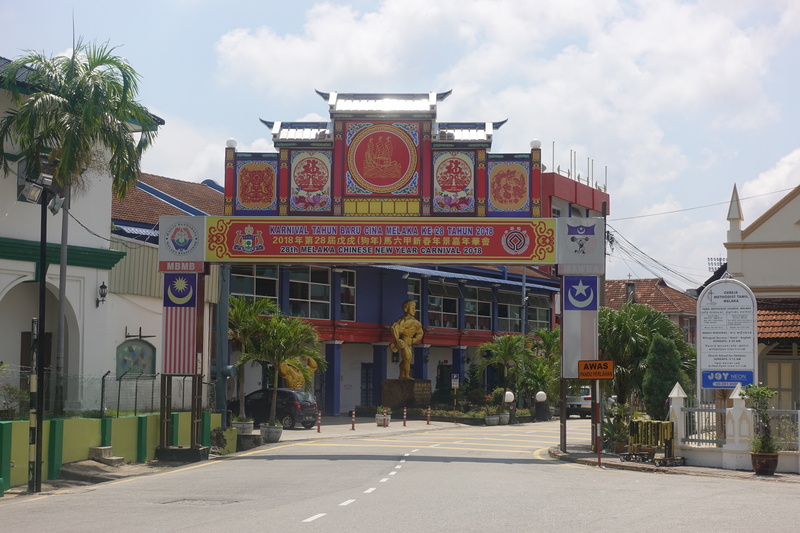 Between Melaka and the Cameron Highlands, we rode through the cities/towns of Kuala Pilah, Manchis, Bentong, and Sungai Koyan. 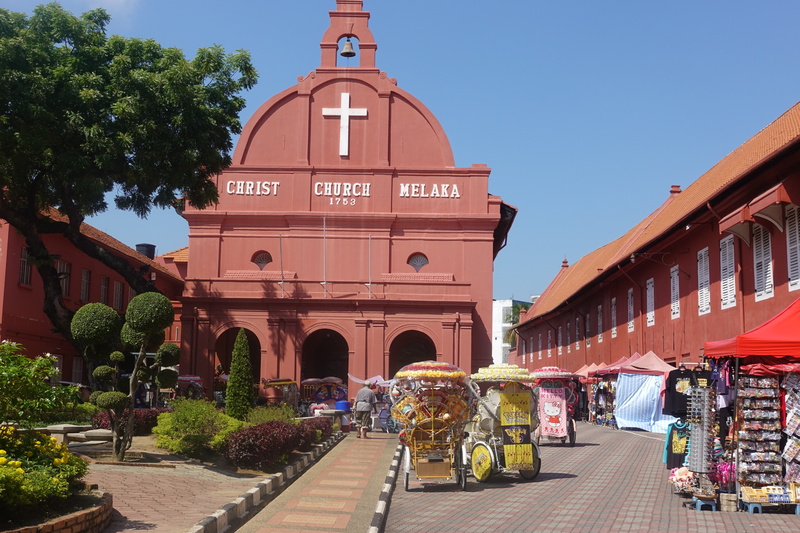 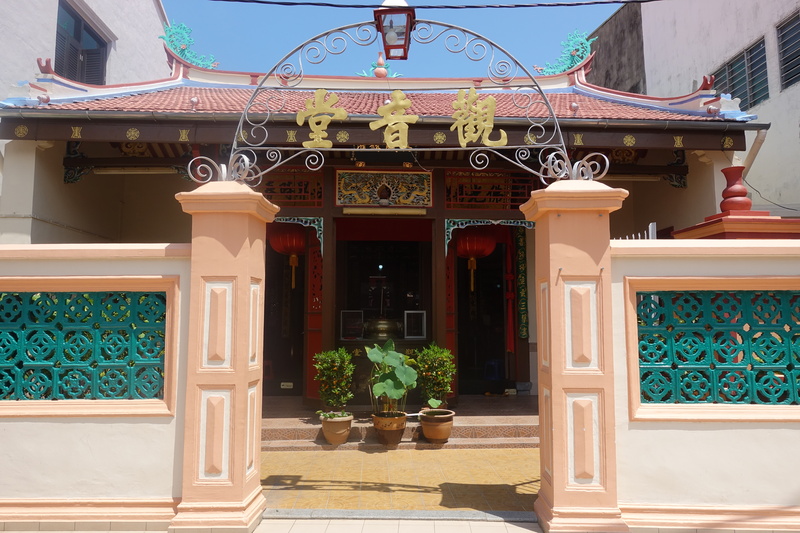 Although these areas weren’t on the tourist trail and didn’t have a deep history like Melaka, we still visited their downtown areas and various houses of worship. 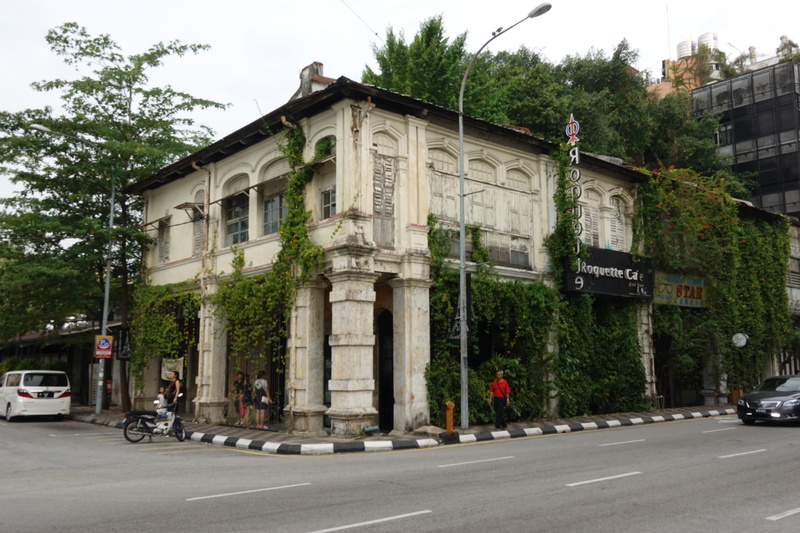 We chose that road “inland” to avoid going through Kuala Lumpur, a huge city that seems to have for point of interest only its two Petronas skyscrapers… Going inland brought us into hillier sceneries, a more chilled atmosphere, less traffic, and endless palm tree plantations! 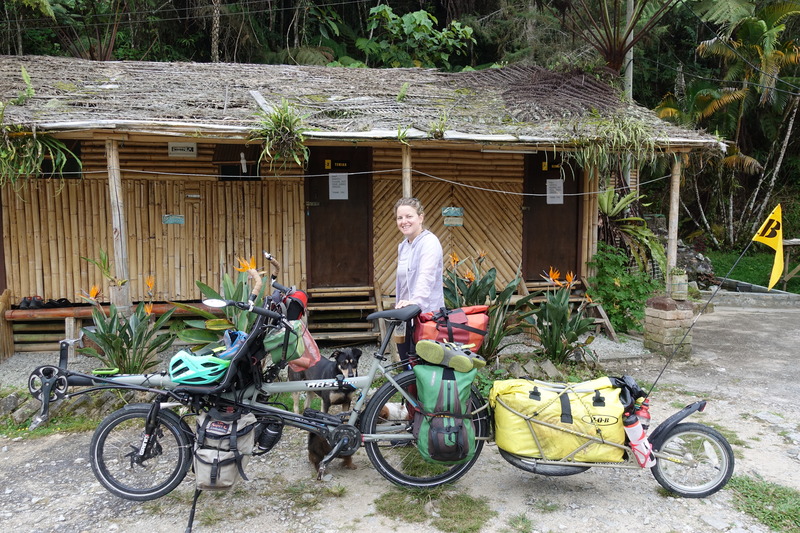 We stayed three days and two nights across the Cameron highlands, after a never-ending sun-burning ascent, some enjoyable time in cooler climate at altitude over 1000m, and an awesome smooth descent (large curves, constant gentle downhill percentage, large clean shoulder, 50km continuously going down: we managed to break our average hourly speed by even doing picture breaks!). 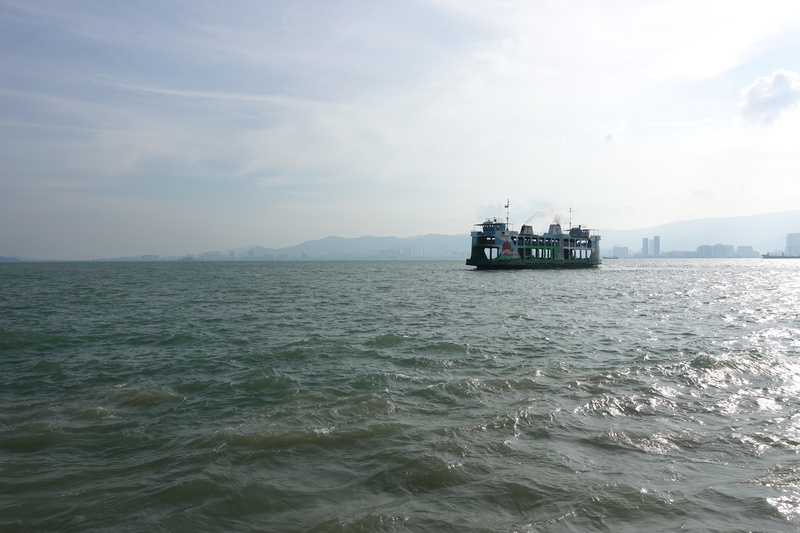 Check our previous post about the Malaysian climate in June (the “dry monsoon”). 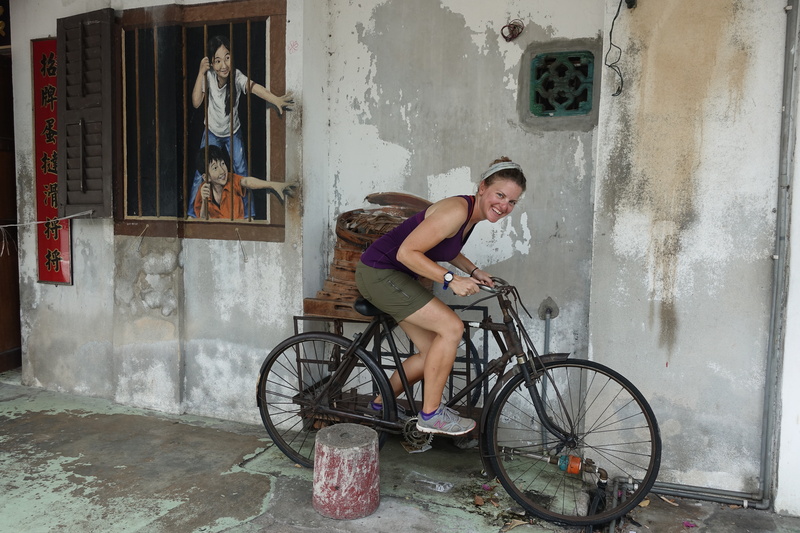 After leaving the Cameron Highlands, we cycled through Ipoh and Taiping- both larger cities with a more historical background. 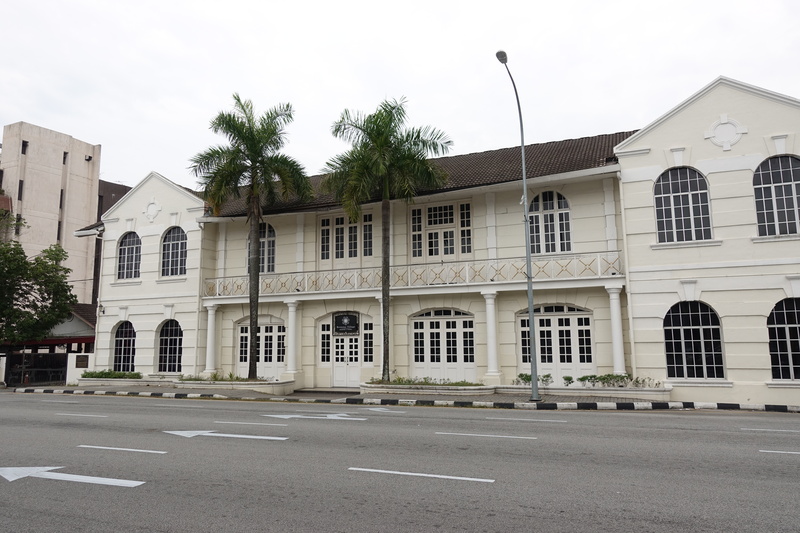 Although Ipoh was only named a city in 1988, it is home to large municipal buildings built by the English in the early 20th century. 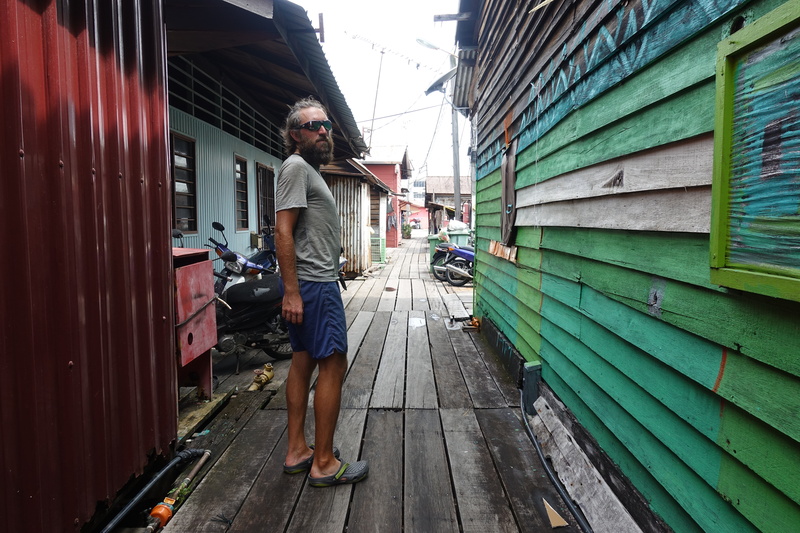 Cédric and I spent our evening roaming around this area and the areas with more modern buildings and trying durian (the fruit that smells bad) ice cream – once we got over the initial spoonful where all of its odor hits you like a garbage truck, it was pretty alright. 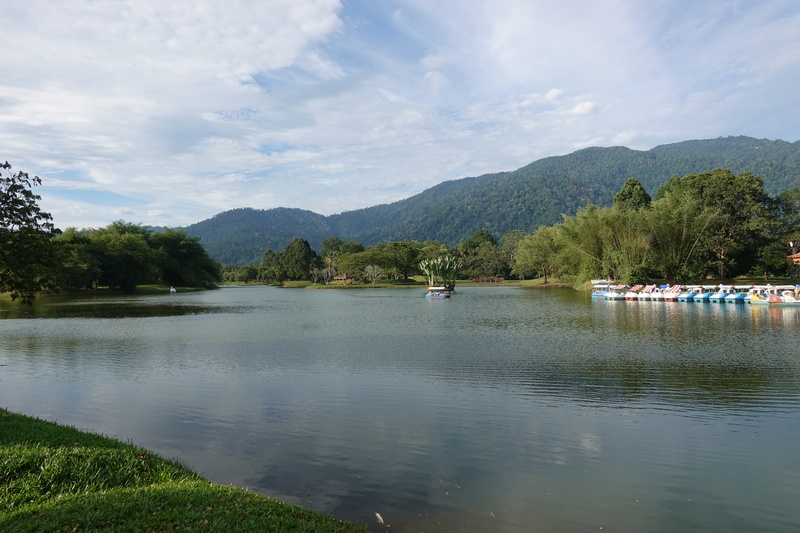 In Taiping, Cédric and I utilized the remaining daylight hours to walk around the city’s Lake Gardens, which previously served as a tin mining site before it was transformed into a lake with paths, pagodas, and rental swan paddle boats. 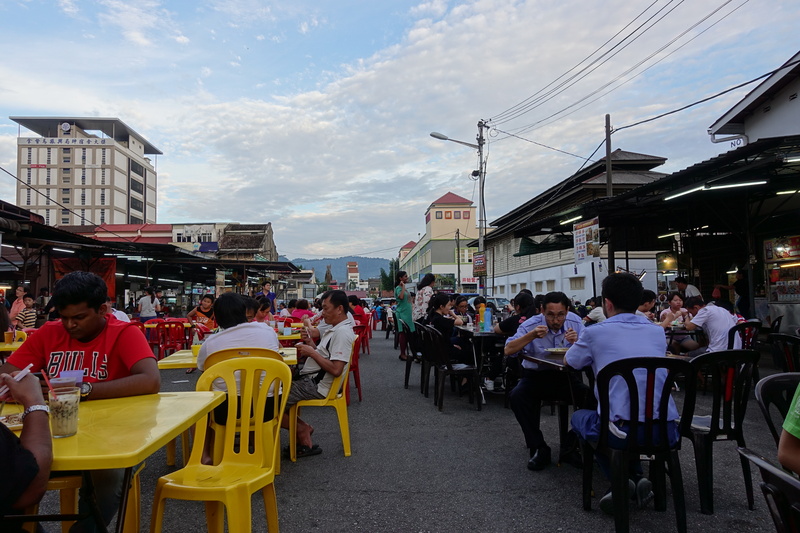 The downtown area of Taiping also had many old shophouses in various states of color and preservation, and a great thing is that they close many roads of the city center in the evening to install large street food courts – and no cars also means a quieter, more enjoyable atmosphere. 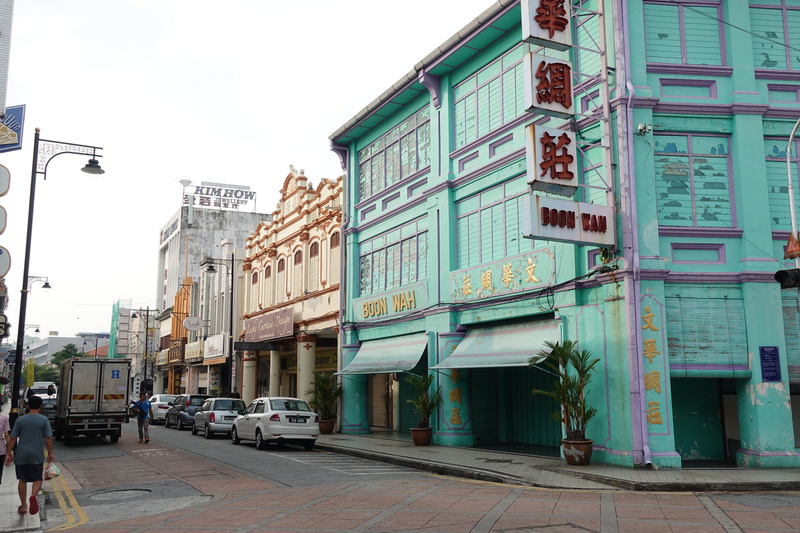 The last city we visited in Malaysia was George Town. 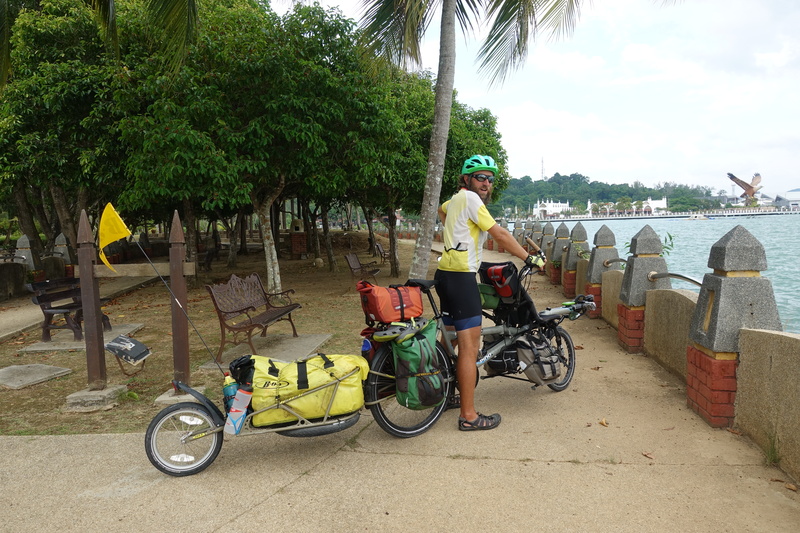 Although Cédric and I could have continued cycling up the west coast towards Thailand, we decided that we had enough of the busy traffic, and on that stretch of coast the important number of trucks going north towards the main border with Thailand (and after to the rest of Asia). 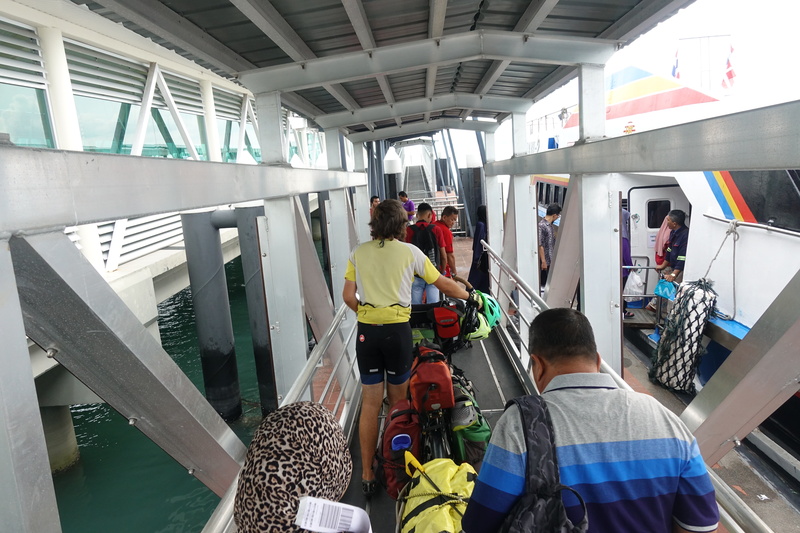 Instead, we would take a series of ferries from Butterworth to George Town, George Town to Langkawi, and Langkawi to Satun. 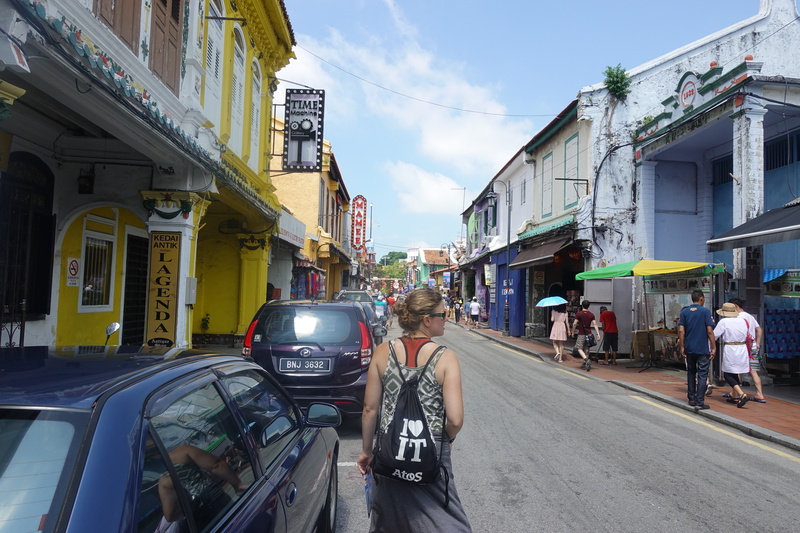 In George Town, we took a full day off from cycling to explore the city. 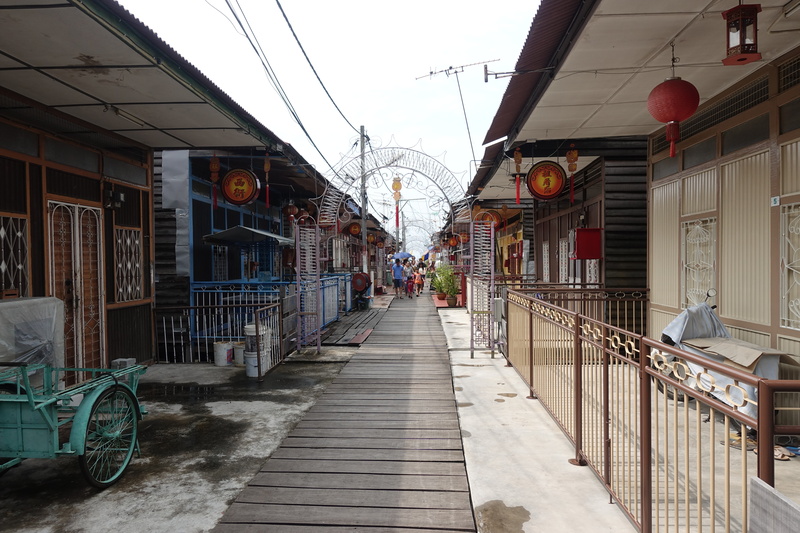 Our day began wandering through the Chinese and Indian neighborhoods in the core of the city, followed by the ‘Clan Jetties,’ where shops and wooden houses extended far past the water’s edge. 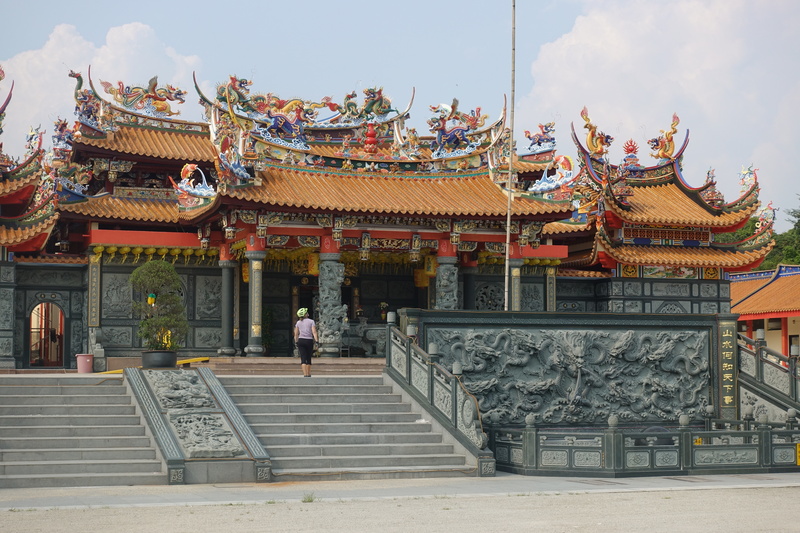 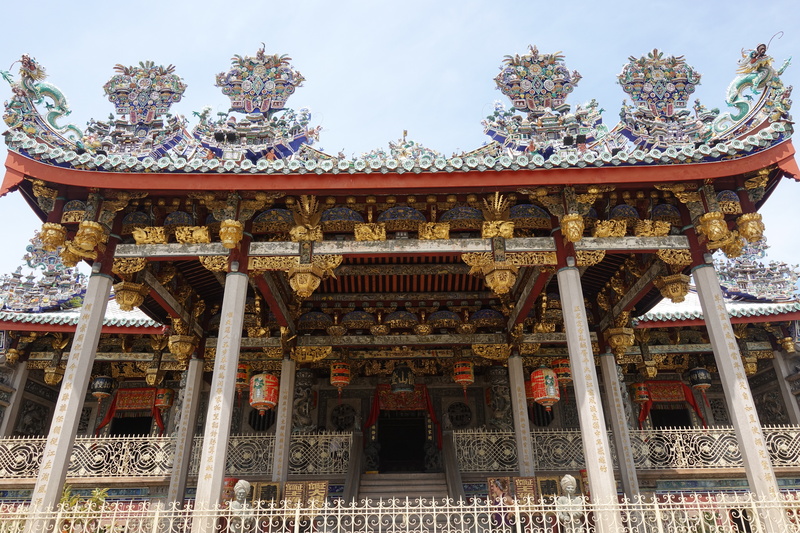 We rounded out our day by visiting the elaborate Chinese temple and museum in Boon San Tong Khoo Kongsi. 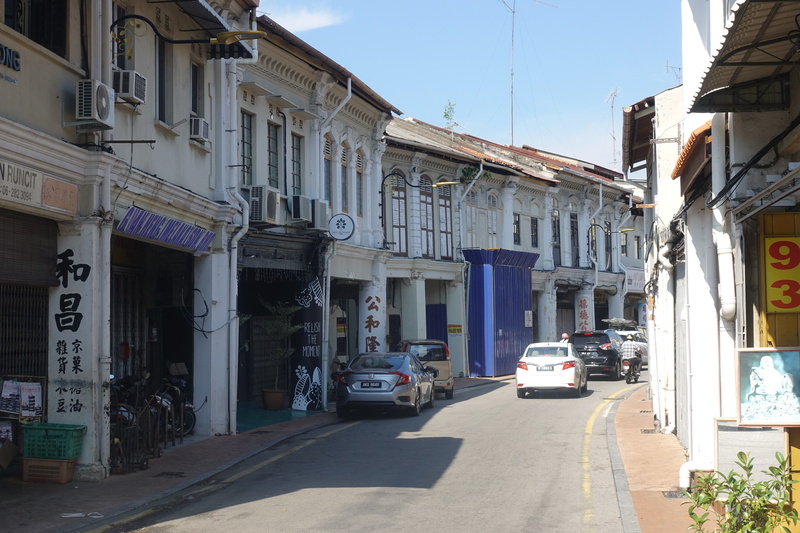 Melaka and George Town both share a similar history pattern, with various influences from the various main trading partners or colonial powers visible throughout the city. 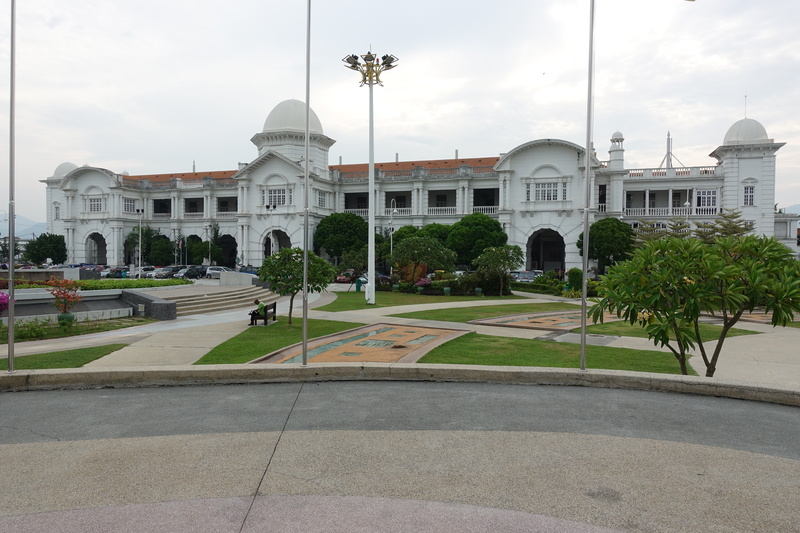 Yet Melaka turned more into a middle size city-museum focusing on tourism, whereas George Town (also called Penang) continued to have an important economic growth and is now the second largest business center of Malaysia with lots of shipping, industries, a major airport, etc. 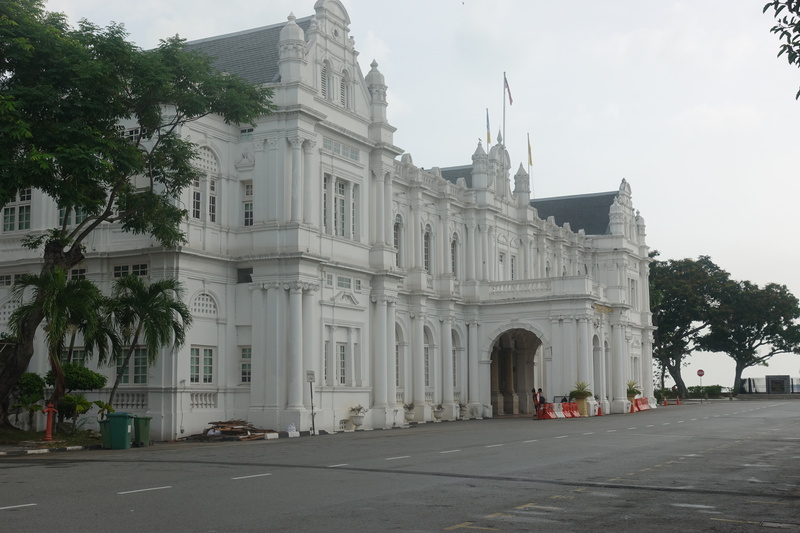 Penang has thus more modern high-rise buildings outside of the historical center. 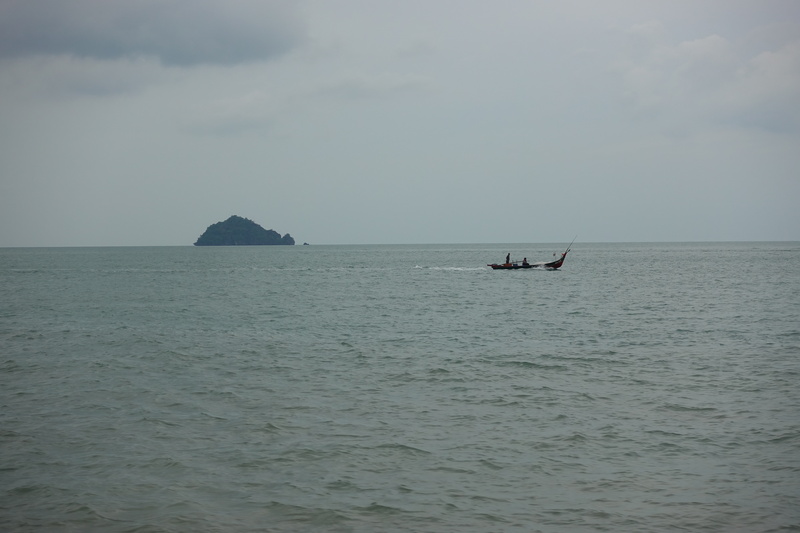 Our last day in Malaysia was spent traveling from the island of Penang to the island of Langkawi, and then to Thailand’s mainland. 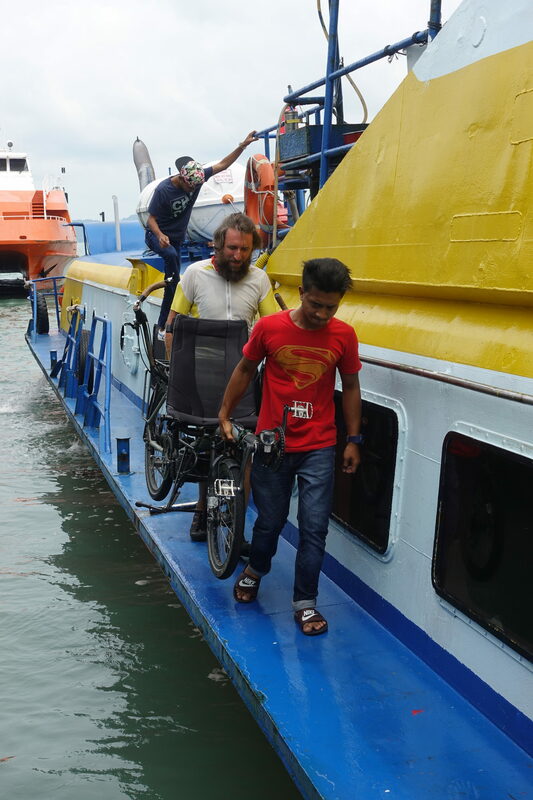 The bike had an interesting trip on both ferries, as it was hoisted and dangled over water between the boat and the dock. 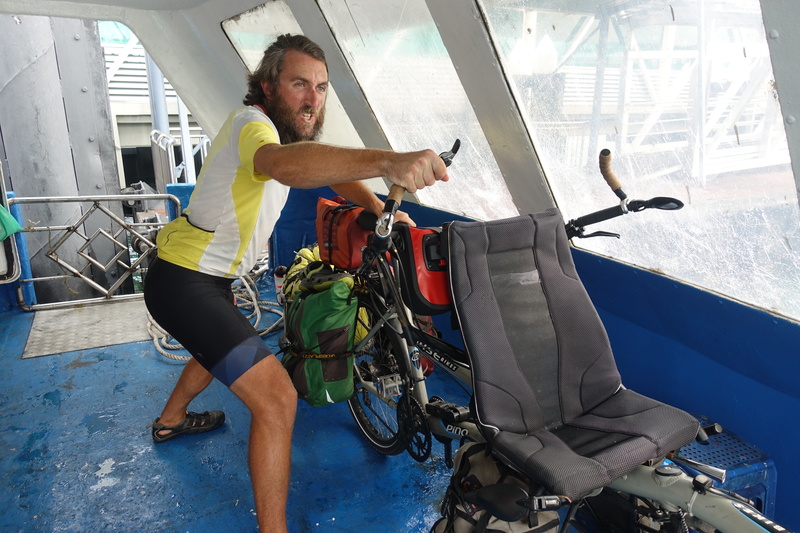 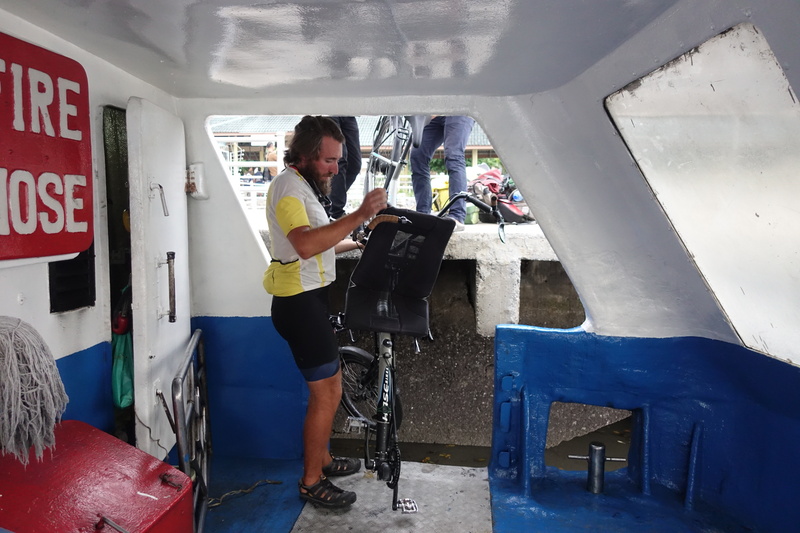 Luckily for us, the bike, and all our gear made it safely to Satun’s port (partially because Cedric spent the ride on the back of the boat behind the engines trying to hold everything together in the swells). 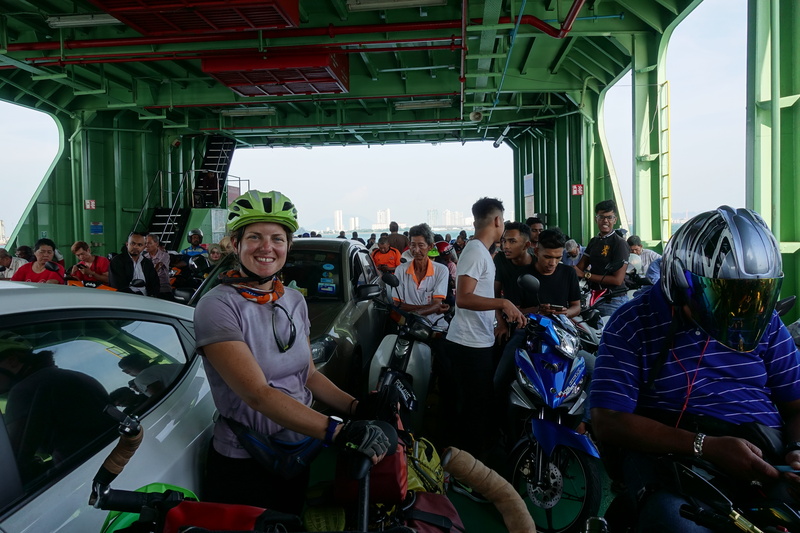 Taking the ferry to go from Malaysia to Thailand may sound like a weird decision as both countries share a long border without particular geographical features (ie. 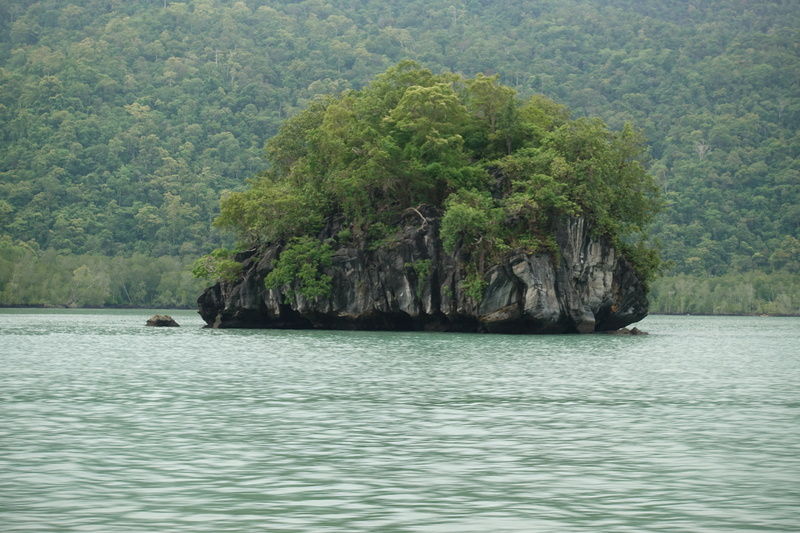 mountain range or large river), but it was definitely a good decision to avoid exhaust fumes… and notoriously corrupt Thai custom officers apparently inventing all sorts of specific visas and entry constraints. 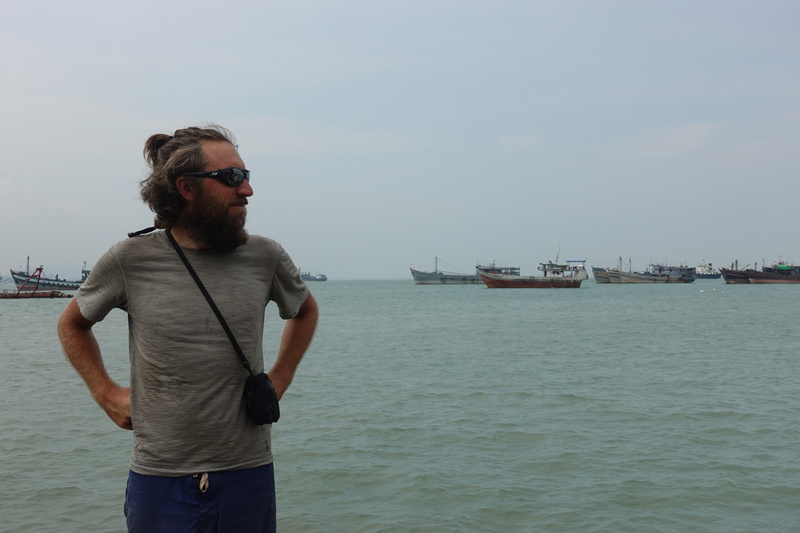 When you get out of a ferry already a few kilometers into the country it is a bit more difficult to send you back on the other side of the fence if you don’t give the extra banknotes. 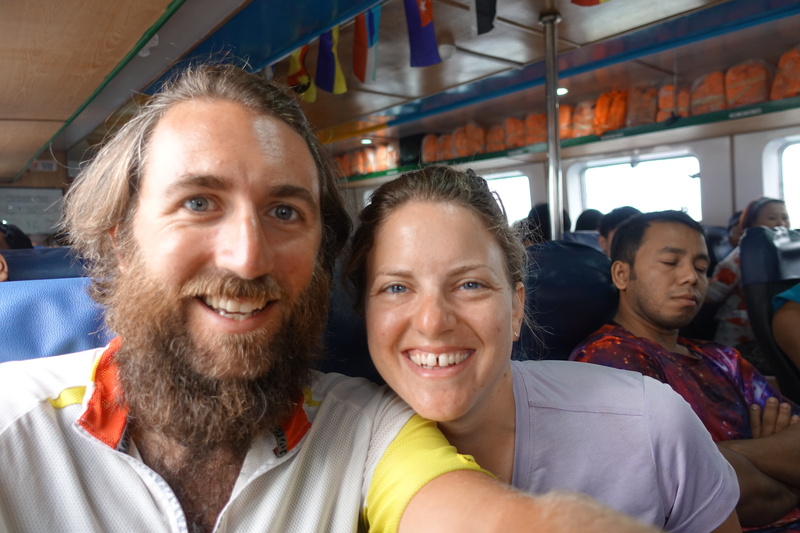 Our first welcome in Thailand was taking multiple selfies with onlookers, including the custom officers and ferry crew, as we waited in line to go through customs.